The legendary vocalist Billie Holiday was born 100 years ago today. Though a household name nowadays, she struggled to achieve the same notoriety as singers like Louis Armstrong and Ella Fitzgerald. Strongly influenced by Armstrong and Bessie Smith, her style was a hit in Harlem. Mainstream audiences took a while to come around. Early in her career, one Chicago club manager took her aside and told her she sang too slow, dragged the tempo and missed the beat. She offered to cut him a deal: “I’ll sing for free if you let me sing the way I sing.” He refused, and she walked. As Holiday’s career began to take off, she found herself singing alongside some of the prominent Big Band leaders of the team — Teddy Wilson (1935-1938), Count Basie (late 1937), and Artie Shaw (1938). Like other black performers at the time, Holiday faced racial discrimination, often at the hands of stage managers, hotel owners and others who took issue with black singers mingling with white musicians. But her bandmates would be the first to stand up for her. 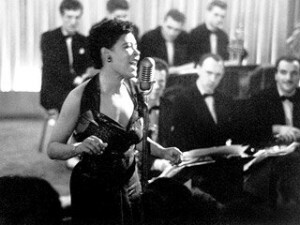 Billie Holiday once told singer Rosemary Clooney of a time when Holiday performed with Artie Shaw’s orchestra in Kentucky. There wasn’t a hotel in town willing to rent her a room. 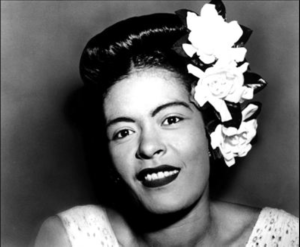 Billie Holiday’s calm, laid-back vocal style masked a troubled story inside of her. Born to a 13-year-old mother, raised mostly by her grandmother, and jailed at a young age for prostitution, Billie Holiday first sang to make a living, not necessarily to pursue a passion. She struggled with an addiction to narcotics and ultimately succumbed to the effects of cirrhosis on July 17, 1959. Her legacy lives on today as her recordings are remastered and re-released, and top hits like “God Bless the Child” and “What A Little Moonlight Can Do” are among the most-covered songs in her repertoire. for a special tribute to Billie Holiday.